Those of us who have been in implants for some time have seen the companies evolve from small businesses promoting the advancement of dental implants to huge monoliths promoting their own profit margin. We aim to change the UK dental implant market by selling a top quality implant at almost half the cost of the main implant companies, whilst delivering excellent service. We will achieve this by running an efficient business without maintaining an expensive base of representatives or subsidised jollies. You can place an order over the phone with our friendly and knowledgeable staff – all of whom have real life implant experience – or online at a reduced cost. We can provide unparalleled training on the implant system at our training facility. This can be on real patients provided for you. 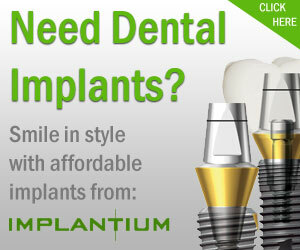 Implantium UK is owned and run by UK dentists who have a huge amount of experience of implants in general practice. We also have the back up and knowledge of a team of registered specialists covering all the main specialities. We also operate a very successful training facility and offer hands on clinical training as well as clinical support in your practice. Visit the Implantium website for further information.